This is a traditional craft and has been practised in India for the last 300 to 400 years. The oldest centre is Jamnagar in Gujarat where women have been involved in this craft since the time of the Mughal Emperor Aurangzeb. This craft is also found around the delta of the Godavari river. The lace industry at Narsapur in Andhra Pradesh has been encouraged due to its links with the outside world. (Over 300 kinds of designs are made by the women of Narsapur.) Women from the fishing communities are mainly engaged in the craft; their familiarity with net-making helps them with the crochet work. Both in Tamil Nadu and Kerala lace and crochet embroidery was introduced by Dutch and Portugese missionaries. 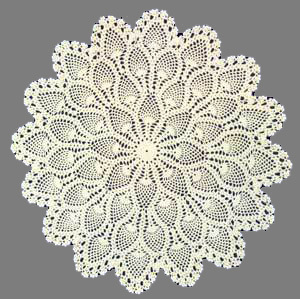 Chetipani is the simplest kind of crochet and is usually made by the beginners. The other kind is Athakupani or joint attachment, in which different kinds of flower designs are combined to form the pattern. The combinations are harmonious and require a lot of imagination and dexterity. The designs are inspired from floral, nosegay, almond, and date motifs. The colours used commonly are black and brown with white and ikat weaves. The products dominantly comprise items for household use: curtains, bedspreads, and furniture covers. 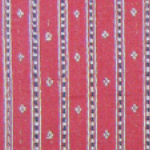 Dress materials often have crochet pieces as borders. Large pieces of crochet are preferred in the export market. In Tamil Nadu a variety of exquisite cotton and silk lace is being made.